I always seem to have a jar or two of jam or jelly with just a spoonful at the bottom. Never wanting any of that deliciousness to go to waste, I periodically post on a new use for my leftover preserves. This is a summary of previous ideas with a few new ones thrown in for good measure! 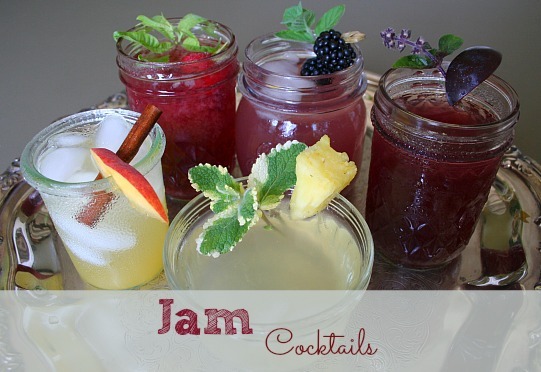 I love a good jam cocktail. All it takes is a spoonful or two of jam, some alcohol, some juice and you are good to go! The possibilities are endless and my latest recipe is here with links for more. If you want a non-alcoholic beverage, try my new favorite – A Jam Spritzer served in a canning jar. Combine a heaping spoonful of your favorite jam with 1/4 cup warm water in a pint-sized canning jar. Add a lid and shake the heck out of it. Remove the lid and add ice. Top it off with sparkling water or club soda. Enjoy! 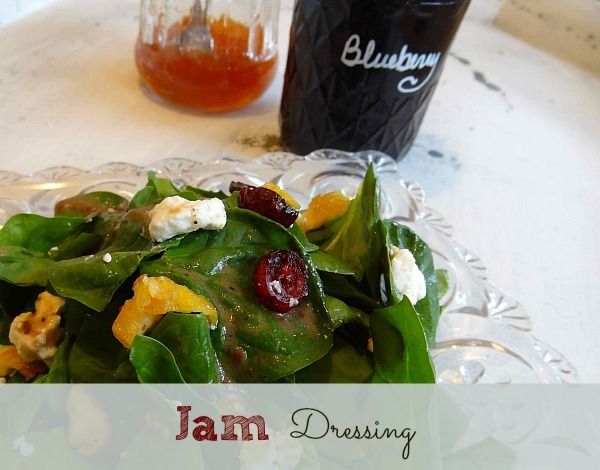 With every jam, you get a completely different flavor combination and unique salad dressing. But they all are fast and easy ways to freshen up a garden salad. I first made a dessert glaze with a failed batch of berry jam. The jam had turned out too runny for toast, so I used it as a topping on ice cream and pound cake. It rocked! After that, I was hooked and now make dessert glaze on the fly with regular jam. You just water down jam (or jelly) with a little bit of warm water. In a small canning jar, combine equal parts jam with warm water. Shake well until the jam is thinned out. Drizzle over your favorite dessert. Yum! A spoonful of jam can sweeten up anything from a smoothie to hot or cold tea. Experiment! Spoon jam (or jelly) over cream cheese and you have an instant appetizer to serve with crackers. My favorite is a spicy recipe like pepper jelly, but they all work! A simple reduction sauce can be taken to a new level with just a small scoop of garden sweetness. Hey, when you have just a spoonful left at the bottom, there is nothing better than just eating it up with a spoon – especially the no sugar varieties. Mmmm…Pure heaven. Do you have ideas to add? I add leftover jam to fruit-veggie smoothies. Leftover jam is great mixed with a serving of homemade greek yogurt. YUM! 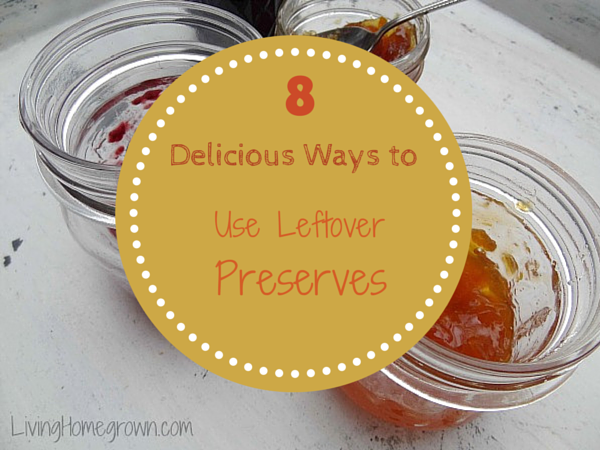 We add leftover jams / jellies to sauces or gravies. Apricot adds a wonderful, tangy sweetness to clear chicken gravy, and it only takes a spoonful. And if there are only two of you at home, you can thin any jam or jelly down a tiny bit, and drizzle it over potato pancakes topped sour cream (instead of applesauce). Tasty change in routine! Dot bits of strawberry or raspberry leftover jam on brownies (before or after they go in the oven). A spoonful of jam of any flavor gives a sweet tang to homemade barbecue sauce. Spoon it into oatmeal, onto pancakes (or right into the batter). Use the last spoonful in a glaze for pork or chicken. What about using them to make fruit flavored wines and mead? Would the pectin be a problem? Hmmm…Interesting question Betsy. I suppose it depends upon how much you use. The pectin should not be a problem because all fruit has a natural pectin. But the thickness of the jam/jelly would make more of a clump than a drink. You could certainly add the jam/jelly to fruit juice so, I would say using your preserves would just depend upon the recipe and what exactly you are doing with it. I meant brewing wine using the jam as a fruit and sugar source. 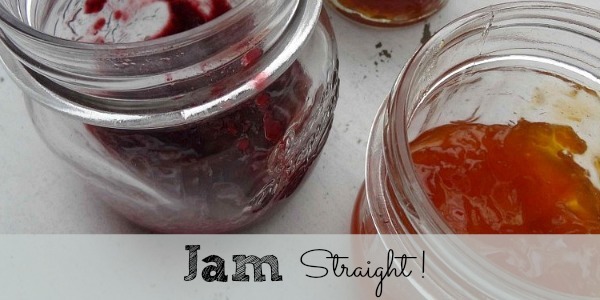 By the time you mix, ferment and rack the wine several times the jam won’t be a clump. Growing up, we always used Mom’s homemade jam and jelly on pancakes and waffles. I was a teen before I realized most people used syrup. Oh Laura – that is wonderful and cute at the same time! With all those opened jellies, jams, and preserves that have collected in the fridge, I combine and make Refrigerator Jam. HINT: keep pepper jellys, jams, preserves, seperated to make a totally diferent jar. Most children do not like the heat.